The sun is now well and truly out in the UK – the only problem is I’m still bearing all the hallmarks of a very gloomy start to the summer. In preparation for the holiday and festival seasons yet to come, Dior is helping me to whip myself into shape, so every Thursday for the next six weeks I will be testing out a different Dior essential. The first step? 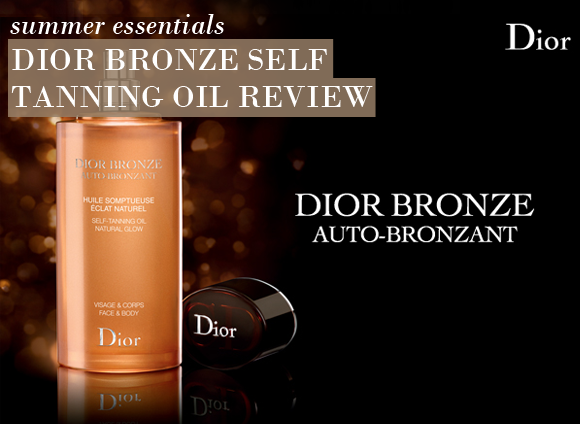 A gorgeous, French Riviera-esque bronzed glow courtesy of the new Dior Bronze Auto Bronzant Self Tanning Oil! Described as ‘a moisturising, luxurious tanning oil that boosts the natural production of mood-lifting beta-endorphins’, this silky formula is a real treat to apply. I have very dry skin, particularly on my legs, and find that oils are the best way to regulate the patches of dehydration. Mixing my usual oil application routine with a hint of a bronzed glow has been ideal. 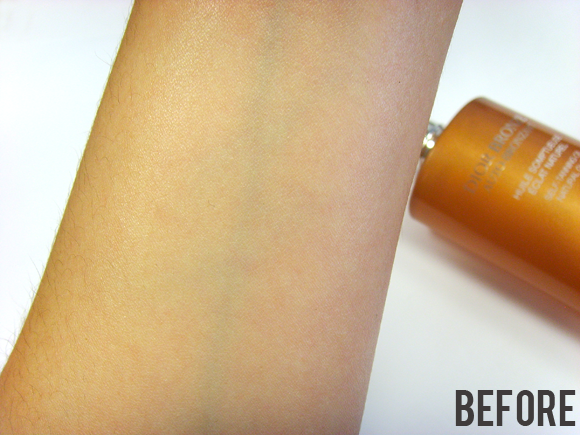 The Self Tanning Oil applies in an even mist and provides a satiny sheen without greasiness. I spritzed some of the product all over the body, opting not to use a tanning mitt as I didn’t want it to absorb all of the oil. To make sure I’d applied it all over, I worked it in with my hands before washing them immediately. The oil sunk in very quickly, and developed in about 2-3 hours. I reapplied once more after this time for a deeper hue. All of this took a fraction of the time it usually takes me to apply self tan thanks to mist format of the spray. The fragrance is a big part of the pleasure of the oil. It doesn’t have that same strong scent as other self tanning products – instead, it is made up of solar floral notes including orange blossom, rose, musk and vanilla. The delicate aroma is designed to immediately boost the mood and create a sense of wellbeing. It doesn’t linger for too long, however, and I found it didn’t interfere with the scent of my perfume. My skin feels incredibly soft and supple and the colour looks very natural – more of a ‘glow’. The ease of application means that I’ve been able to top up my colour twice this week with no fuss, and as the mist is so fine I have had no trouble with patches or streakiness. After my first application, the tan lasted for almost a week before fading very gradually. Normally I have a bit of trouble with my self tan fading in uneven patches, but the fineness of the application seemed to prevent this from happening. While I have been wary of certain tanning products in the past, I really look forward to using this unique formula. A definite winner for those with dry skin and little time on their hands. I really love this self tan. it so lightweight and very easy to apply. The spray is a very fine mist, which coats the skin evenly. I apply it in the shower and then rinse the shower down for zero fuss, and then reapply after a couple of hours for a deeper golden colour. The smell is gorgeous, too. Really floral. 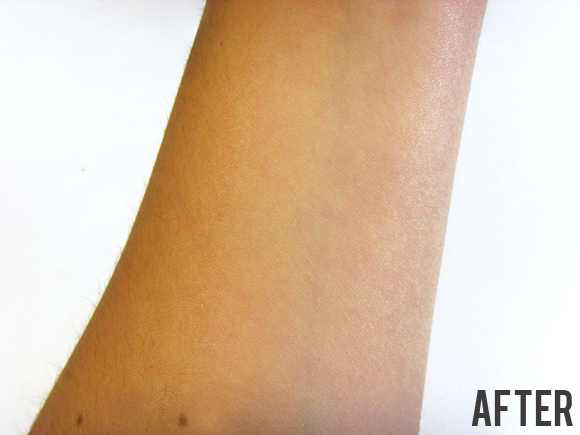 This entry was posted on Thursday, August 2nd, 2012 at 1:00 pm and is filed under Sun and Tanning, Swatches, Tried & Tested. You can follow any responses to this entry through the RSS 2.0 feed. You can skip to the end and leave a response. Pinging is currently not allowed.